Guess what? We had some brief snow on one of the highest mountains in Scotland but what about the rest of us. Nothing of course. In fact some areas in Scotland and SE England saw 20°C this week. Not bad going that for late October. Off Trick-or-treating or to a bonfire this weekend, then it’s not looking too bad. Thursday will start wet with a band of heavy rain moving from west to east. The afternoon will be much better with sunny spells and drier conditions. Max 13°C. We drag up very mild air again on Friday and after a few morning showers the afternoon should be drier but staying generally cloudy. Temperature above average. Max 16°C. Similar to the last two days sees Saturday start cloudy with a little rain or drizzle about. This soon clears to a day of bright or sunny spells. Light winds as a ridge of high pressure builds from the south. Max 14°C. Sunday is likely to start misty or foggy and a little chilly. Not a bad day in store with bright spells at times. Light winds and a little cooler. Max 13°C. Next week doesn’t see much change with mostly dry weather around, some milder spells with light winds. Certainly no sign of an early winter chill. High pressure builds in later this weekend settling the weather down once more. Photo: BBC Weather. Well would you believe it. The newspapers, sorry trash-mags, are at it again. “It’s going to snow next week”; “It’s going to be the coldest, snowiest winter for 50 years” and of course what we all want “A White Christmas”. What a load of nonsense, putting it politely. It’s nothing but guesswork and in a word ‘lies’ in order to sell papers and get everyone talking. In truth, no-one knows what this coming Winter will be like and yes I personally would love a White Christmas and several feet of snow; but all I can do is hope. There are no facts and proof that all the media stories hold any truth. So, no snow on the horizon just yet 🙂 but what can we expect the coming 4 days and into next week. A cloudy start to Thursday with some local drizzle or light rain around. Generally a drier picture after that with sunny spells. Feeling cooler than Wednesday with the odd afternoon shower possible. Breezy. Max 13°C. Friday will be quite similar. A little ridge of high pressure settles things down, so bright spells and mainly dry. Just a very low risk of an isolated shower. Light winds. Max 13°C. The weekend will not start well as a band of rain spreads in from the north-west on Saturday with some heavy bursts and gusty winds. This will sink south and leave some drizzle behind it for a few hours. Eventually drying up into the late-afternoon or evening. Gusty south-westerly winds for a time then switching back north-westerly and easing slightly. Not much difference in temperatures to previous days but it will turn cooler later on. Max 13°C. A colder feel to Sunday with bright spells and some scattered showers. A chilly breeze across the region but looking a better day than Saturday. Temperatures down a notch. Max 11°C. Looking ahead into next week the Atlantic is pretty much back in charge bringing spells of wet and windy weather but with sunny spells and drier interludes either side of low pressure systems. 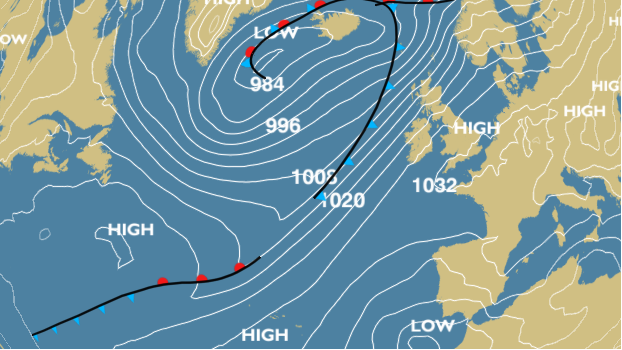 High pressure remains in charge of our weather and is established away to our east introducing cold winds. Of course no snow, crazy media talk as usual, but some parts of Eastern Europe have seen an early snowfall. Looking ahead little change. A cold and possibly foggy start to Thursday with a touch of ground frost. A day of sunny spells to follow with a chance of a shower in the east. Cold breeze. Max 13°C. Friday is likely to see more in the way of cloud and a shower or two can’t be ruled out. Again some bright spells and a cold east to northeast breeze. Max 13°C. I wish I could promise something more interesting over the weekend but I can’t. Saturday and Sunday similar days. Sunny spells at times but also a lot of cloud coming in on a chilly northeasterly wind. Any cloud breaks overnight will lead to mist and fog patches and a local ground frost. Max 11-13°C. No immediate change on the horizon (boring) but it won’t be long before the high pressure slips away and we see a more unsettled theme return. After a lengthy settled spell, some autumnal conditions returned earlier this week but as we enter this forecast period, high pressure slips over the UK. A lot of media have been banging on about ex-hurricane Joaquin racing across the Atlantic towards the UK. At this moment, the deep area of low pressure is likely to dart towards France and northern Spain, so not affecting the UK. After a muggy few days it’s now cooler and fresher and this will be felt on Thursday with a chilly start with local ground frost. A reasonable day follows with sunny spells and mainly dry. Low risk of a shower. Max 15°C. The nice weather continues on Friday with it being dry with plenty of bright spells. Light winds as well so not feeling too bad. Max 15°C. Mainly dry weather over the weekend but cloud amounts will be variable and a cool breeze from the east will pick up. Saturday will be bright after a cold start with some mist or fog patches slow to clear. Feeling fresh in the afternoon breeze. Showers or rain could sneak in from the east overnight especially over the hillier areas. Max 14°C. Sunday brings bright spells and turning dry after some early showers. Again a cool breeze. Max 14°C. Looking ahead it seems the high pressure will stay close by keeping it mainly dry with bright spells. If Joaquin changes path then so will next week’s forecast, so keep your eye on Twitter. September 2015 Stats: Warmest 20.5°C; Coldest 5.8°C; Wettest 16.8mm; Windiest 28mph; Total Rainfall 46mm.